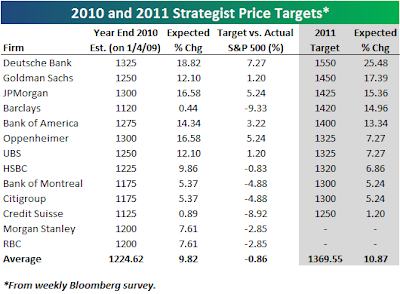 Almost uniform agreement by the strategist community that 2011 is a "must win" year (assuming the S&P does not tack on an additional 50 points before Dec 31st). 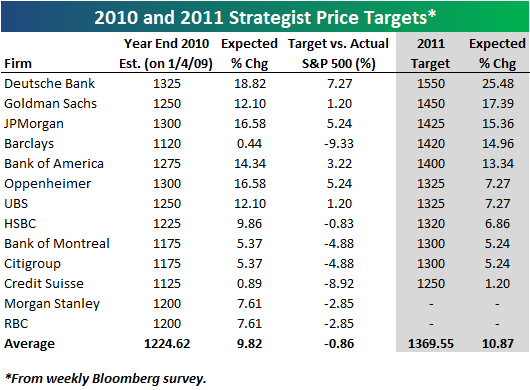 Only Morgan Stanley is calling for flattish year over year gains in the S&P 500. The easy route each year is just to throw on another 8-11% of earnings growth, and commensurate stock price appreciation - and this appears to be most are going. Many also are targeting S&P 500 profits at peak levels (or higher) of low to mid $90s - and expect some PE multiple expansion. For example, S&P earnings end 2011 of $92 x 14 PE ratio = 1288. This falls in the range the bottom half of the analysts are figuring for 2011, whereas the aggressive players are talking 1400 to 1550. Either earnings would need to explode towards $100+ or multiple expansion would be required. For a relatively slow growth country, heavily based on financial earnings, it is hard to make that argument ....but in a low interest rate environment some will claim 15-16x PE ratios are fair. As always take these with a grain of salt, coming off record profits in 2007 what this sort of chart predicted for 2008 would be laughable in retrospect.